I saw a photograph on the National Geographic website recently that I found quite interesting. 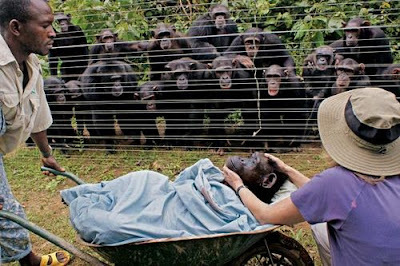 The photograph was taken by Monica Szczupider and shows a group of chimpanzees watching from behind a fence as one of their own, who had recently died, was being wheeled away to be buried. The dead chimp was named Dorothy and was quite a popular and beloved figure among the other chimps at the Sanaga-Yong Chimpanzee Rescue Center in Cameroon. Dorothy had been rescued eight years prior and had become a maternal figure to the troupe of chimps housed at the center which rehabilitates apes victimized by loss of habitat and the illegal bush meat trade. According to Szczupider, "As Dorothy's health improved her deep kindness surfaced. She mothered an orphaned chimp named Bouboule and became a close friend to many others, including Jacky, the group's alpha male." She added, "Her presence, and loss, was palpable, and resonated throughout the group. The management at Sanaga-Yong opted to let Dorothy's chimpanzee family witness her burial, so that perhaps they would understand, in their own capacity, that Dorothy would not return. Some chimps displayed aggression while others barked in frustration. But perhaps the most stunning reaction was a recurring, almost tangible, silence. If one knows chimpanzees, then one knows that they are not usually silent creatures." I try very hard not to "humanize" animals and assign characteristics and emotional capacities beyond their capabilities. However, the more I look at the great apes, the more I begin to wonder just where their "limits" lie. It is impossible to look at this photograph and not sense that this group of chimps was experiencing feelings of grief and sadness. We have learned a lot about the great apes over the last couple of years. Some of these discoveries are detailed in the Great Ape Behavioral Parallel Series of articles I have been working on the last few months. With each new discovery we seem to find that these creatures are capable of much more than was ever thought possible. Maybe emotions like love, grief, loss, and sadness are not beyond them after all. We who are actively trying to prove the existence of the sasquatch are often asked, "Why are they so hard to find?" The answer may be far simpler than most suspect. If the sasquatch is a great ape that makes it, by default, an amazingly intelligent creature. If, as I suspect, it turns out to be the most intelligent of the great apes then that may be all the explanation necessary to explain why these incredible creatures are so hard to locate and pattern. Last Saturday I went to service one of my game cameras in a fairly remote area here in Central Texas. Usually, it is a simple and quick process to bait the area with food or scent, change the batteries and film, and reset the camera. Usually, the entire process takes all of about 15 minutes. I try to get in and out quickly so as to minimize human scent in the camera location and let things settle down and get back to normal as quickly as possible. Once the camera has been taken care of I will usually hike the surrounding area looking for animal sign. Sometimes, when I'm not in a hurry, I will find a quiet and secluded spot and just sit quietly for a while. I am a teacher and coach and live with three women so silence is a rare and precious thing to me. Several times I have had animals walk out of cover very near to me while I sat quietly watching. This is precisely what happened to me last Saturday. I had discovered the camera in this particular area had malfunctioned. So, I removed it and went for a hike. I walked to the end of a rutted and little used road and sat down on a fallen tree. I wasn't concealed very well. The tree had fallen across the road. I sat down right in the middle of the log in what would be the middle of what remained of the road. There was thick brush on both sides of the road, however. I really wasn't too worried about being concealed. I was more concerned with my malfunctioning game camera. I removed the camera from by backpack and began to fiddle with it to see if I might be able to get it working after all. I guess I had been at it for about ten minutes when a coyote walked out of the brush to my left about 30 feet in front of me. The coyote was not a particularly handsome specimen. He was a bit ragged looking. He looked like he might have recently rolled around in something. He had unusually big ears and legs that seemed a bit long. I'm guessing, due to these characteristics, he was fairly young and had not yet filled out or "grown into" his ears. He was mostly gray with specs of black on his back and sides. He had a lot of reddish orange coloration on the back of his ears and his legs. While I'm guessing he was a juvenile due to his gangly appearance, he wasn't particularly small. I estimate that he was about knee high to me at the shoulder with his head higher than that. I'm a bit over 6' 3" tall and pretty long legged so he was decent sized. The coyote stepped out of the brush and walked out to the middle of the rutted road. For a couple of seconds he was in full profile to me. He failed to notice me as I was, unintentionally, downwind from him. He stood there with his nose high for a couple of seconds, I assume, sniffing the air. When he did turn his head and noticed me he jumped almost straight up and slightly back. It was obvious he had not realized I was there and his reaction was pretty humorous. It was then his behavior got a little strange. He did not run away. Neither did he take his eyes off me. He simply laid down where he was with his head on his forelegs and paws. I just looked at him for a few seconds expecting him to leave but he didn't. I had a digital camera in my backpack and decided to try and reach it so I could snap a picture. When I reached for my pack he did not move but growled. I froze and watched. He just lay there. I reached for the camera a second time. Again, the coyote growled but remained still. I really wasn't sure what to do. He did not seem threatening but didn't seem to like it when I moved. I don't know how long I sat there, a minute or two, I suppose, trying to decide what to do. It turned out I didn't have to decide anything. For no apparent reason, the coyote stood up and trotted back the way he had come. I continued to sit there for a few minutes more before I, too, got up and started back to my truck. The more I thought about the incident the more unusual it seemed to me. I felt like I had just experienced something special. Now, after reading about the fatal coyote attack in Canada (see post below) I wonder if that was the case. How long would I have had to sit there if he had not gotten up to leave? How would the coyote have reacted had I stood up and tried to walk away? Valid questions, in hindsight, for which I have no answers. I would be greatly interested to know if anyone else out there has experienced anything like this. You can respond in the comments section below this post or email me at texascryptidhunter@yahoo.com. A PROMISING young Canadian musician has been attacked and killed by coyotes while on a tour promoting her new album. Taylor Mitchell, 19, was considered a rising star of the folk music scene, having just earned a Canadian Folk Music Awards nomination. She was hiking alone on the Syline Trail in Cape Breton Highlands National Park when a pair of coyotes attacked her. Tourists rushed to her aid when they heard her screams and found Mitchell bleeding heavily from mulitple wounds "all over her body", according to The Canadian Press. "She was losing a considerable amount of blood from her wounds," paramedic Paul Maynard told TCP. One of the animals was later shot by the Royal Canadian Mounted Police, but the other got away. Park officials said it was highly unusual for coyotes to be involved in such an aggressive attack. Mitchell was due to play at a concert after her hike and was on her first tour of the Candaian east coast. This is an incredibly rare occurrence. Truth be told, I've never even heard of a coyote attack on a human. They are usually very cowardly when it comes to interacting with humans. The whole incident goes to show that you must take nothing for granted when out in the field. Whenever possible, a partner should be present. 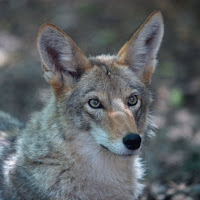 The story really sent a shiver down my spine as I had a strange encounter with a coyote this past weekend. If you read down to my post from October 25th below you will note that I mentioned a very unusual and amazing experience in the last line of the article. The experience involved a coyote. I will write that up tomorrow. Once you read what happened, I think you will understand why what seemed to be a pretty cool experience now gives me a serious case of the creeps. I went out this afternoon to try to service two of the game cameras I have out here in Central Texas. It was a disappointing day. I went to take care of Camera #2 but discovered it was gone. I guess somebody came across it and decided to take it. I am a bit surprised as it was in a spot up on a bluff that is not too easy to access. However, in hindsight, it was just too close to an area where people hike and fish. Lesson learned. I then proceeded to the other side of the county to check on Camera #3. This is the camera I feared had been stolen when I could not locate it last weekend. I remembered to bring my GPS unit this time and was able to locate the camera. Much to my chagrin, it had malfunctioned and would not operate properly. So, out of five cameras I had out, or intended to put out, in the field three are now broken, one has been stolen, and one just does not seem to take pictures of anything but scenery. I was quite bummed out but not too surprised. After all, these cameras were old 35mm dinosaurs with painfully slow trigger speeds. It would have taken a tremendous amount of luck to capture a big cat on film with these old cameras. So, it appears my camera-trapping project will have to be scrapped for the time being. I will have to begin the process of saving up for some higher quality digital cameras with quicker trigger speeds. The news was not all bad today. I actually had quite an interesting and amazing, to me anyway, experience while out in the field. I will write about that very soon. I thought I would remind everyone that the two hour season finale of MonsterQuest will be airing tomorrow night (10/24). The episode features the expedition undertaken by Adam Davies in search of the yeti. The expedition team was actually air lifted by helicopter to an extremely remote location in the Himalayas. They then hiked for several additional days to reach their target destination. This strategy hasn't been employed since the famous Tom Slick expedition many years ago. Several stories have leaked out regarding the hardships and dangers endured by the team during their time in the Himalayas. It should make for some interesting viewing. Loren Coleman has posted a great write-up on the upcoming episode and has posted some exclusive photos over at Cryptomundo. You can access the write-up here. This week, yesterday specifically, marks the 42nd anniversary of the day Roger Patterson and Bob Gimlin filmed a large upright hair-covered bipedal creature at Bluff Creek in Northern California. The film set off a firestorm that has yet to abate to this day. I remember seeing the Patterson-Gimlin film for the first time at a small theatre in East Texas. I was spending a weekend with my grandparents at the time. My grandmother took me to a movie every day of that week. I don't know if she was spoiling me, just liked going to the movies herself, or a combination of both, but I digress. I do not remember what movie we went to see but I do remember a short documentary that was shown before the main feature. 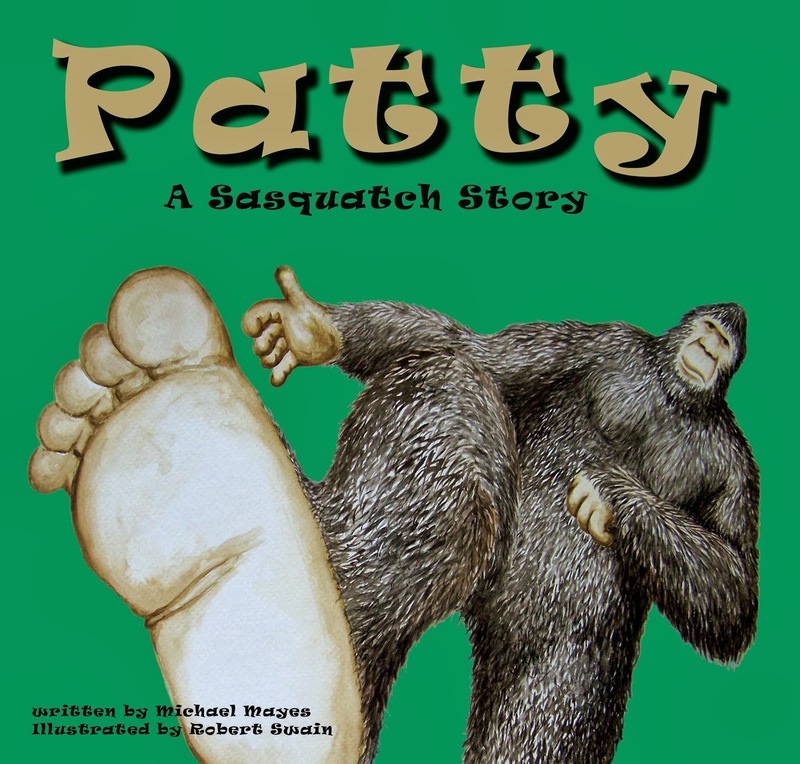 The subject of the documentary was bigfoot and the P-G film was the centerpiece of the production. This would have been in the mid 1970s so the P-G film was still less than ten years old. Needless to say, the film made quite an impression on me. I have since viewed the film many many times but I will never forget that first impression it left on me. Many attempts to duplicate and/or debunk the film have been made through the years. Not one attempt has been successful in recreating a subject as compelling as the sasquatch in the P-G film. You will hear claims that the film has been proven to be a hoax. This is simply not true. An example of this would the National Geographic Channel's attempt to recreate a convincing ape suit for their Is it Real? program. The suit they produced and the video created at the Bluff Creek film site were a total joke. The suit did not look real, the actor's gait was unnatural and clumsy, and the net result looked nothing like the P-G film. However, this did not stop the producers of the National Geographic show from declaring that their experiment proves the P-G film to be a hoax. This is the sort of "proof" that has been presented as evidence of a hoax at Bluff Creek in 1967. The fact of the matter is that the more the film is studied by open- minded scientists, the more difficult it becomes to write it off as a hoax. There is quite a bit of compelling evidence pointing toward the P-G subject being a real living and breathing creature. Check out Meet The Sasquatch by Chris Murphy, Sasquatch: Legend Meets Science by Dr. Jeff Meldrum, and Bigfoot/Sasquatch Evidence by the late Dr. Grover Krantz for some fascinating reading along these lines. The evidence presented and the conclusions reached are fascinating. One of the best presentations I have heard on the likely validity of the P-G film came from the TBRC's Alton Higgins. The point is that there are many out there who feel the film does show a real animal walking across that sandy creek bed who back up their opinion with some very good research. I, of course, can't say for sure that the film is legitimate. Something about it, and this is totally unscientific, has always rang true to me. There is something about how the creature moves that, while familiar and human-like, is alien. I have viewed a lot of alleged sasquatch videos and photos. There are only two other pieces of footage that I have seen that strike the chord within me that the P-G film hit and one photo that I feel might be the real deal. Again, my gut feeling does not prove anything. However, sometimes you have to trust what your eyes tell you. I have always felt there was a very good chance the P-G film was legitimate. I felt this way even before I got serious about delving into this mystery. I feel even more that way now after having had the chance to meet Bob Gimlin. He is a gentleman and has spent a lifetime outdoors. He has worked with and around animals his whole life. This is a guy that knows how an animal moves, looks, and smells. I believe he is telling the truth about what happened that day. Certainly, my impression of Mr. Gimlin does not totally discount the possibility of a hoax. Simply, my gut feeling is that he is telling the truth. If the film was hoaxed, I believe strongly, Bob Gimlin was not in on it. Are we any closer today to determining whether or not the film is real? I doubt it. I don't know how many more ways this footage can be dissected and analyzed. I do think one must bear in mind that there is no way Roger Patterson could have anticipated the advent of digital technology and the level of scrutiny his footage would undergo. The fact that, despite the best efforts of would be debunkers armed with technological tools only dreamed of 42 years ago, the film cannot be proven a hoax after all this time must say something about the chances it is authentic. If it is a hoax it is truly a great one. Are we closer to documenting the sasquatch as a real species? I think so but the progress is painfully slow. Sniping among research groups, charlatans looking to make a buck, lack of funding, a skeptical to openly hostile press, and worries about how looking into this mystery would be received from employers continue to bog the search down. So, here is to that 42 year-old piece of film. Maybe one day soon all the speculation about whether the footage is or is not authentic will be moot. I certainly hope so. It was a disappointing weekend on the camera-trapping front. I was way overdue on getting my cameras refreshed so I set out to take care of cameras #3 and #4. They are the most remotely placed of the four cameras I have out but are not too far from each other. I hit camera #4 first. If you have followed this project you will recall that I wasn't too happy with the location of this camera. When I got to the camera it had fired 31 times. This was not too big a total considering how long the camera had been out in the field but, I reasoned, there are only 24 exposures on the roll of film anyway. I pulled the camera from the location as I located a much better looking spot not too far from camera #2 that I want to try. I left the area and proceeded to the area where camera #3 is located. It was at this point that I realized I had pulled a real bone-headed stunt. I had left my GPS unit at home. The location of camera #4 is, in my opinion, the best location I have found but is difficult to locate. I know I was all around the camera but was unable to locate it without the GPS unit. This means one of two things. It could mean that the location is remote and not easily found. In other words, it is an ideal spot. On the other hand, the fact that I could not find the camera could mean that it was found and has been stolen. As I said, I know I was all around the cameras location. Hopefully, I will be able to get back out there next weekend with the GPS unit and locate it. Well, I reasoned, at least I have the film from camera #3 to develop and check out. I was to be disappointed, however. Not a single animal was captured on film. I don't really understand it. I had 24 shots of scenery. No deer, no raccoons, or anything else. I can only assume that a slow trigger speed is to blame. I simply must bite the bullet soon and upgrade to some higher end cameras. So, it was sort of a lost weekend as far as my big cat project goes. The effort was good, however. I will keep plugging away and eventually upgrade my equipment. Once that happens I should begin to see better results. In the meantime, I will just have to hope I get lucky with the 35mm cameras I do have. 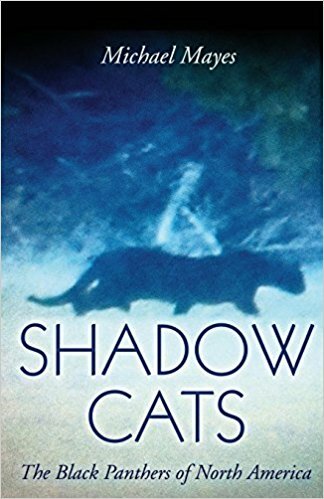 A reader sent me an email a little while back detailing a sighting of a large cat in the Lewisville/Flower Mound area recently. His email, minus some details that might have compromised his identity, is below. Good morning! I personally have seen a large cat in my neighborhood in Flower Mound. I have dogs, so I am 100% sure that it was not a dog. The body structure was not a dog, and it ran completely different. It size was roughly the same as my lab/rhodesian mix. I cannot say that it was black. It appeared to be light colored, but it was at night. I live near Timbercreek. 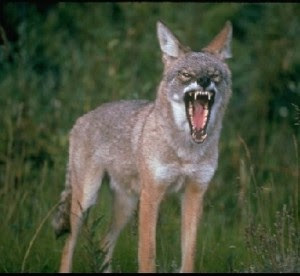 I have seen a coyote in broad daylight in my neighborhood. This occurred earlier this year. I was driving home at night. I turned off of Cross Timbers on to Timbercreek Road. As I approached Buckthorn, a large cat ran across Timbercreek Road in front of my car. It took me a second to realize what it was and turned my car onto Buckthorn Court (to the left). It ran across Buckthorn in front of my car again and disappeared up in bushes in front of a home. I was not about to get out of my car, but I drove around Buckthorn and Timbercreek for about ten minutes after this happened. I did not see it again. When the large cat crossed me the first time, it was coming from the right side of Timbercreek Road. The area has homes but it has a group of homes with acreage and most have horses. I know at least one also has chickens. On the other side of Timbercreek Road is the creek. It is heavily wooded. I am not sure if you have received any other feedback regarding the large cat in the area. I did find it interesting that your reader lives in Lewisville and had an experience at night as well. I live right on the border of Lewisville and Flower Mound. 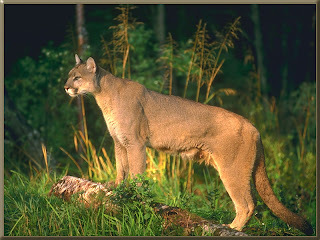 The Texas Parks & Wildlife, as well as most wildlife biologists, scoff at the notion of large cats, like the cougar, living in such close proximity to a large urban area like Dallas-Fort Worth. Sightings continue to be reported from surprisingly populated areas. I would encourage people living near riparian areas or on the outskirts of urban areas where big cats have been reported to keep a camera handy. It is going to take some pretty strong photographic evidence to convince the authorities that these cats have become acclimated to semi-urban living. "Nothing that is said, or accused towards the hairy brothers of the forests will cause them to leave their homes, they deal with the round eyes the same as we, they will kill the round eyes to protect their home." There is an interesting article on the Eurekalert.org website about how leopards, and large carnivores in general, may be affected by conversion of forested land to agricultural land and other changing environmental factors. While the article itself is interesting to me it was the method by which the Zoological Society of London, Wildlife Conservation Society, and the Tanzania Wildlife Research Institute obtained their data that caught my eye. These organizations conducted the largest survey of Tanzanian carnivores ever undertaken using over 400 camera traps. "Camera traps provide a fantastic opportunity to gain knowledge on habitat use and spatial distribution of otherwise elusive and poorly known species," said Dr. Sarah Durant from the Zoological Society of London. Dr. Durant went on to call camera trapping a "powerful tool." In addition to the information on leopards collected by this camera-trapping project, data was collected on bushy tailed mongooses. In fact, the first documentation of this species in one of Tanzania's most populated areas was obtained. This study further validates the use of game cameras as a viable method of documenting rare and elusive species in a given area. This is exactly why the Texas Bigfoot Research Conservancy has undertaken Operation Forest Vigil, their camera-trapping project, in an attempt to document the sasquatch. This is also the reasoning behind my, albeit much smaller, camera-trapping project by which I am hoping to document the presence of large cats such as cougars in Central Texas. I just do not understand how anyone can discount this method as a waste of time and money. Rare and endangered species such as the Sumatran rhino, Sumatran tiger, the snow leopard of the Himalayas, the Okapee, and many others have been documented in areas where it was feared they might have become extinct. A prime example of the latter is the documentaion of jaguars in Arizona. Camera-trapping is here to stay and has been proven effective. The trick is having enough cameras in the field to saturate a large area. The organizations working together on the Tanzanian leopard project placed more than 400 cameras in the field. Having a large number of cameras in the field is critical. With only a handful of cameras it truly becomes a crap-shoot as to what you are able to photograph. This is precisely the difficulty individuals and/or private organizations like the TBRC face when trying to put together a successful game camera project. The high end cameras needed to do the job right can cost anywhere from $300-$600 each. Add in the cost of gasoline burned traveling to and from camera locations, batteries, memory cards, protective boxes, chains, and locks (needed to discourage bears and thieves) and a large scale camera project gets pricey very quickly. 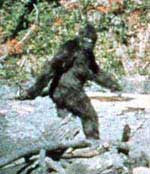 Critics claim that camera traps have failed to produce any photos of the sasquatch therefore either the method is flawed or the species simply does not exist. I would counter with two simple points. First, nearly all game cameras in the U.S. are pointed at deer feeders. They are not placed out in the most remote areas of the country where the sasquatch is most often encountered. Secondly, there has simply never been a camera-trapping project anywhere close to the scale of the Tanzanian leopard study conducted anywhere in North America. 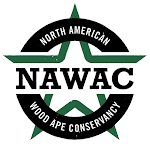 It is my opinion that if a major university or private donor stepped forward with the funding the sasquatch would likely be documented within a 1-3 year period. I truly believe that. Here's hoping that funding will become available for such a project in the not too distant future. 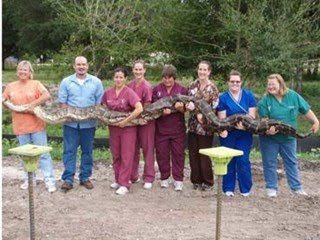 This past summer several large Burmese Pythons were captured in South Florida. It is a well-established fact that many owners of these exotic serpents have turned them loose in the Everglades and other areas of Florida once the snakes became too large and too dangerous to handle. Many snakes have been captured over the last decade but all were identified as former pets that had been released into the wild by irresponsible owners. What caught my eye on this news story is that the 17 ft. 206 lb. python captured this past summer was wild. This confirms that these pythons have become acclimated to the swamps of Florida and have begun to breed successfully. A large population of Burmese Pythons in Florida could wreak havoc on the delicate Everglades ecosystem. You can access the news story here. The article got me thinking about the similarities between the Everglades of South Florida and swamps and bayous of Southeast Texas. A little research reveals how similar these two areas of the country really are. For the sake of this article I compared Okeechobee, Florida, where the wild python was captured this past summer, and Beaumont, Texas, which lies just outside the borders of the legendary Big Thicket. Beaumont lies at a mere 16 ft. above sea level. Okeechobee sits at a towering, by comparison anyway, 29 ft. above sea level. These two areas are also very close in latitude. Beaumont comes in at a latitude of 30.08 degrees North while Okeechobee sits at 27.74 degrees North latitude. 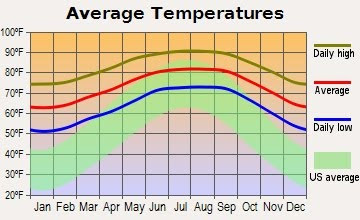 This is a difference of a mere 2.34 degrees. Based on these facts, a reasonable assumption would be that the two areas would have similar climates. A little more digging reveals that to be the case. 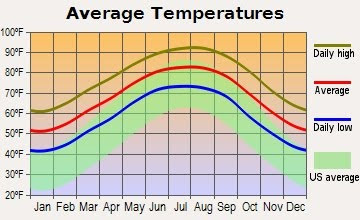 The following two graphs show the average temperatures of Okeechobee (top) and Beaumont (bottom). 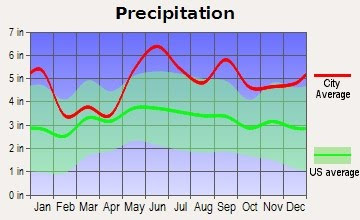 Rainfall patterns proved to be similar as well. 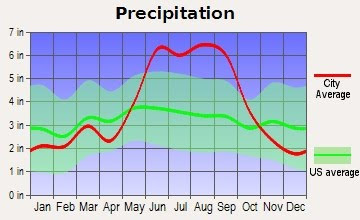 See the charts below showing annual precipitation in Okeechobee (top) and Beaumont (bottom). The similarities between the two areas lead me to think that exotic snakes, like the Burmese Pythons being seen in Florida, would do just fine here in the Lone Star State. This could be an ecological disaster for indigenous species of our state. Everything from birds, to mammals (large and small), to alligators would be on the menu for these giant constrictors. 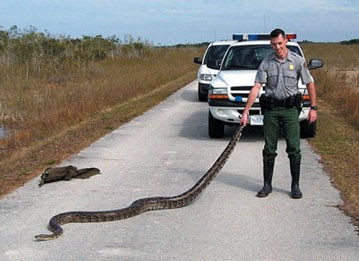 I fear it is only a matter of time before reports of giant snakes begin to come in from Southeast Texas. It may become an even larger problem, however. 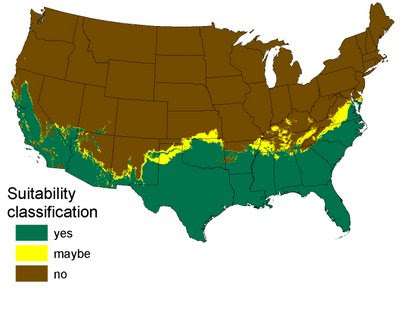 The USGS recently published a graphic (below) showing just how much of the continental United States would be considered suitable habitat for pythons. The graphic is sobering. I would ask any readers who sight what they believe to be one of these snakes or who come across any news articles documenting their presence in Southeast Texas / Southwest Louisiana to alert me. I hope I'm wrong but it is my opinion that we will begin having to deal with the problem of giant snakes in Texas sooner rather than later. ADDENDUM - Ok, I had not seen the recent article from Texas Fish & Game about giant snakes in Texas when I wrote the above article. However, the article confirms my suspicions as it mentions a 13 ft. long Burmese Python captured in a ditch in Port Arthur, Texas. Give the article a look here. I had a disappointing weekend in some respects in regard to my camera trapping project. I was due to refresh Cameras #1 and #2. Yesterday (Saturday) I was not able to get out at all due to some pretty heavy thunderstorms. This pretty much killed any chance I would have to get both cameras refreshed this weekend. Today's weather wasn't much better but I was itching to get out and do something positive (watching the Cowboys on television sure wasn't a positive experience today). So, I loaded up with some fresh bait, film, and new batteries and set off to get Camera #1 refreshed. If you have been following this project, you will recall that the location of Camera #1 is very near my home. The location was chosen due to an alleged sighting of a large long-tailed cat crossing the road nearby. The camera is set near a dry creek bed and is usually not too difficult to access. However, today the "dry" creek was anything but dry. The creek was overflowing and the surrounding area was a virtual bog. I should have taken one look at this mess and turned around and gone home. However, I decided to plunge into the brush and get the job done. I slogged through the slop, at times sinking ankle deep in mud, and made my way to the camera. I was pleased to see that 20 shots had been taken. However, since the film I've been using has 24 exposures, I needed to manually rewind the film. The camera refused to rewind. I tried everything I could think of to no avail. So, I pulled the camera completely and trudged through the thorny brush and mud back to my truck. I guess I will take the camera into my photo processor and ask them to remove it in their darkroom. This will probably not be a big deal this one time but will not be a practical solution long-term. It could be that this camera is done. So, today there was a lot of walking, rain, mud, and frustration. Hopefully, the camera is not dead and will continue to be useful. If not, well, my birthday is coming up. Maybe I can upgrade to a digital model. I will update again once I have the pictures developed. My friend, and fellow TBRC member, Jeremy Wells alerted me to an interesting article on the Texas Tripper website. The article discusses the legend of the "Hairy Man" of Round Rock. I live in Central Texas and try hard to stay up on local legends and folklore but this is one story with which I was unfamiliar. The legend goes that the "Hairy Man" lived along Brushy Creek and harassed travelers there until being run over by a stagecoach and its team of horses as he tried to block the road one fateful night. One version of the story claims the "Hairy Man" was an old hermit who, as a child of early Texas settlers, had been separated from his parents. He grew up alone along the banks of Brushy Creek and came to view that area as his own. Locals still claim the ghost of the "Hairy Man" is seen and heard from time to time along the lonesome stretches of the road adjacent to Brushy Creek. The "Hairy Man" was said to be covered in hair from head to toe. The locals seemed to believe this was an adaptation that became necessary as the lost child outgrew his clothing. To make the leap from hair covered hermit to the sasquatch is not too difficult. Could the early Texas settlers of the Round Rock and Brushy Creek areas have been seeing a sasquatch all those years ago? I guess we'll never know. Apparently, this is a pretty big deal in Round Rock. There is a Hairy Man Road in Round Rock and a yearly "Hairy Man Festival" held in October. The article is really more about the festival than the legend but does give the basic background of the legend albeit in a tongue in cheek manner. You can access the story here. You can also access the "Hairy Man Festival" website here. So, if you aren't doing anything this month and find yourself in Central Texas you might want to stop by and see what the "Hairy Man Festival" is all about. I might have to make that short drive myself.